As Courtney herself can attest, I have been very eagerly awaiting my chance to read Angelfire. I first saw it on a blog several months ago, and then featured it on my first Books I Want SO Badly I Could Pee post. I applied to every ARC tour that had it, entered every Angelfire giveaway I could find, and scourged the ends of the blogosphere for a copy. I had fallen in love with a book that I hadn’t even read yet. And fell even more in love. 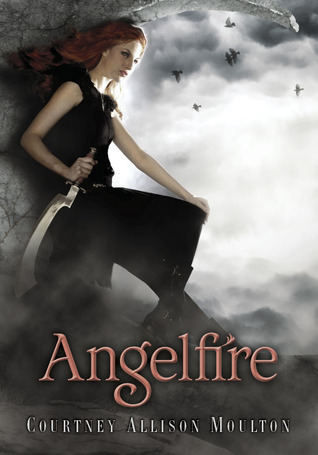 When Angelfire started out, I will admit that I actually wasn’t that into it. It did take a few chapters until I fell into the groove of the novel, and the world built itself in my mind. And then, I was hooked. I sat there curled up in my bed, Nook in hand, for hours until I finished the book. I read it all in one sitting. The concept of the reapers and angels, and the cake frosting in between, was something new. I’ve been reading a lot of paranormal lately, namely where demons and angels are concerned, so this was a cool concept. Especially about Ellie, and her reincarnation cycle. I know there are a lot of things that still have to be revealed about this, so I’m definitely on the lookout for the sequel. An integral part of the novel, and what made it so engrossing, was Will. And not just because he’s a nice piece of man, but because of the intensity of his relationship with Ellie. He’s been with her for centuries, watching and being powerless to save her life as she dies. He loves her. And he’s more than willing to risk everything for her, even his life. He feels guilty that he can never save her, even though she always is reborn. Will is strong and fragile all at once, and reading about him was one of the best parts of this novel. Overall, I loved Angelfire. It had everything I look for in a good novel: dynamic and loveable characters, a rapid-fire plot, and an intricate world that’ll pull you in and won’t let you go. I give this novel 4.5 out of 5 stars. I'm glad you liked it :) Especially after pining for it for so long! I agree about the Dad thing, there's something fishy going on there. Oh, and I loved Will more than I did Ellie, he is such a great character! lol pining that I can pee. I just finished this book last week and loved it. I could not get enough of will. This story was so well written that I can't get over it I am so sad that I have to wait about a year to read the next book that follows!! BTW I also think theres something fishy about her father!